Richard Carranza, superintendent of Houston schools, will become New York City’s next schools chancellor, Mayor Bill de Blasio announced Monday — just days after his first candidate shot down the offer. After stops at school systems in Tucson, Las Vegas, and San Francisco, in 2016 Carranza became superintendent of Houston schools, America’s seventh-largest district, with 215,000 students. He managed the district last fall during Hurricane Harvey, which devastated Houston schools, even as the district faced a $115 million budget shortfall and a potential state takeover of low-performing schools. He brings to New York City and its 1.1 million students experience as a teacher and principal, and an inspiring life story: The son of a sheet metal worker and a hairdresser, and the grandson of Mexican immigrants, Carranza spoke Spanish at home and learned to speak English in public schools. “His story is the story of the American dream if ever there was one,” de Blasio said during a press conference Monday afternoon. At a superficial level, Carranza is not unlike like the man de Blasio first chose, Miami-Dade Superintendent Alberto Carvalho, a Portuguese immigrant who turned down the offer in a strangely captivating televised school board meeting last week. Both men have a track record of prompting meaningful change in urban schools with significant high-need student populations, and both rose from humble origins to top positions in their field. Carranza is an advocate for undocumented youth, and he signed a petition calling on President Donald Trump to keep the Deferred Action for Childhood Arrivals program in place. He’s also, incidentally, an impressive mariachi musician. Carranza has not yet announced an end date in Houston, and retiring New York City Chancellor Carmen Fariña, who has held the position for four years, will stay on the job through March. In New York City, Carranza will get the same base pay he’s getting in Houston: $345,000. 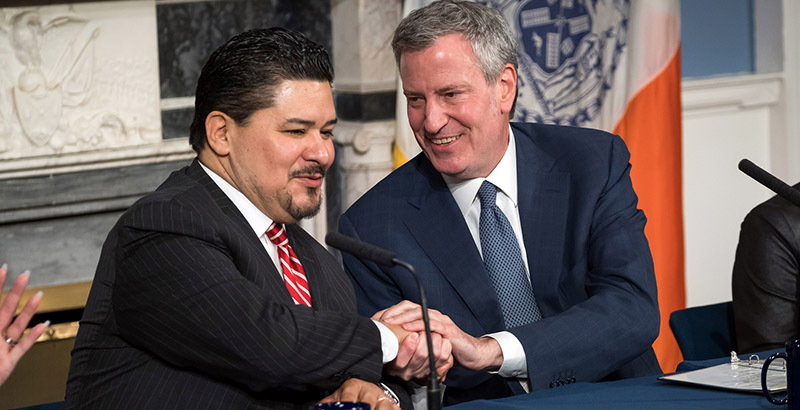 Throughout the Monday announcement, de Blasio praised Carranza as an advocate for marginalized children: LGBT and low-income students, English language learners, and the schoolchildren in Houston in the aftermath of Harvey. “He’s had a proven record as someone who can get results while moving an equity agenda, and that certainly is so powerful to us,” de Blasio said. New York City is home to a powerful and highly political charter school sector, but Carranza didn’t clearly take sides in the contentious battle. He said he’s seen both traditional public and charter schools serve kids well, but he’s also seen them fail students. But on Monday, de Blasio shrugged off the superintendent that wasn’t. De Blasio said he called Carranza last Wednesday and informed him that he was one of two finalists, but he made a “tough choice” to offer the job to Carvalho. Carranza landed in New York on Saturday and accepted the job offer at 10 p.m. Sunday. During Monday’s announcement, Carranza called outgoing chancellor Fariña “one of my educational heroes.” He delved into his personal story to relate to New York City’s 1.1 million public schoolchildren, 40 percent of whom are Hispanic and 27 percent of whom are African American. Additionally, 12 percent of New York City students are English language learners, and more than three-quarters live in poverty. Carranza’s parents didn’t go to college, he said, but they understood the importance of education. “I know that across this incredible city, the city of can-doers, New York City, that there are thousands upon thousands upon thousands of parents who have the same aspirations” as his own, he said. In San Francisco, Carranza focused on increasing equity and creating academic rigor while “overcoming the divisions of the past,” de Blasio said. While in California, the mayor noted, Carranza helped to improve graduation rates and test scores and to close the achievement gap. He also focused on reducing suspensions and increasing the graduation rate of bilingual students. Notably, however, the city’s NAACP chapter recently declared a “state of emergency,” citing achievement gaps that coincide with Carranza’s tenure there. Although the city is one of the highest-scoring urban districts in California overall, 74 percent of black students did not meet state standards in at least one subject area in the 2015–16 school year.